Daily exposure to elements, such as extreme cold and heat, aren't the only things that beat up your car. Dust, air pollutants, pollen, salt, tree sap, bug guts and bird droppings form a thin layer atop your car, slowly damaging the paint, finish and even the undercarriage. 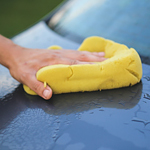 The solution is a weekly wash, especially if you live in a harsh climate or park your car on the street most of the time. As mentioned above, it's advisable to wash your car weekly. However, if the climate where you live is mild and/or you routinely park in a covered garage, you can get by with a car wash every two weeks.